GemTech is the holder of a Certificate of Registration of Quality Management System under ISO 9001:2015, the international standard that helps ensure that GemTech’s customers receive consistent, high quality products and services and improved on-time delivery. By meeting the requirements of this standard, GemTech and its customers will benefit from the implementation and utilization of best practice methodologies. 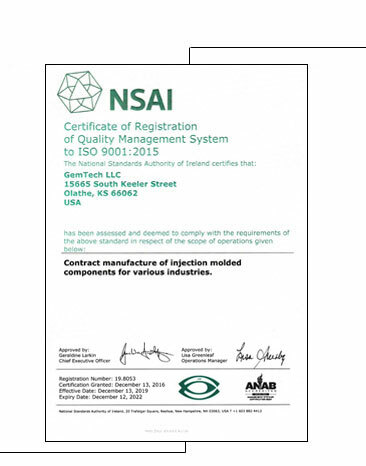 The certification process required hundreds of hours of time by GemTech to become familiar with the ISO 9001:2015 requirements and to establish dozens of processes and procedures at GemTech to meet these stringent standards. GemTech assures that it maintains its ISO 9001:2015 certification by regular outside audits which assure that the quality standards are continuously being met. Most companies do not meet the requirements of ISO 9001:2015. Those which do represent a select group of businesses that are willing to commit the resources necessary to establish and maintain the highest standards of quality in business and industry. GemTech is very pleased to be part of those businesses which meet the requirements of ISO 9001:2015.